Forword Rush, my new action-packed word game, is out now on the App Store! Forword Rush is a new style of hybrid word-action game, featuring adrenaline-pumping word building set to an 80s-inspired soundtrack. I think you’ll like it! It’s a separate download for iPhone and iPad. It requires iOS 7, and supports every iOS 7-supported device except iPhone 4. Check it out now! I’m pleased to announce my third game for iOS: Forword Rush! Forword Rush is a new style of hybrid word-action game, featuring adrenaline-pumping word building set to an 80s-inspired soundtrack. It’s sure to be an experience you’ll never forget, as you race to complete objectives and adventure through three unique worlds. You can get a sneak peek at screenshots and gameplay videos by visiting the Facebook page. Forword Rush is scheduled for release on October 10, 2013. The second expansion pack for War of Words 2 has arrived! 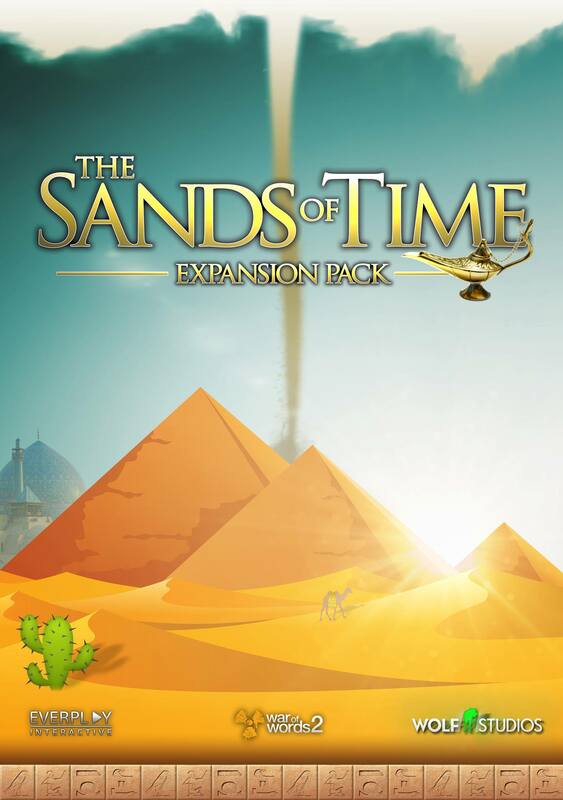 The Sands of Time has players adventure into the desert and expand their word-building powers. Level up to 20, earning 3 new action tiles! But beware: sandstorms, camels, and mummies will stand in your way! Unearth ancient coins, summon a powerful genie, and discover the mysteries hidden in the desert! War of Words 2 is available for download exclusively on the App Store. The War of Words v4.0 update has arrived! It may take up to 24 hours to appear in your local App Store, so stay patient. One change we want to call out in particular: the 4.0 update moves the game to a new set of servers. We believe these servers will be much faster and more reliable than our old ones. We conducted a large-scale beta test to make sure things run smoothly. But despite our best efforts, things could still go wrong! We’ll be standing by to immediately address any issues that come up, if any. Thanks for playing, and enjoy the update! The countdown to the apocalypse begins! We are pleased to announce the official launch date of War of Words 2! It will be released on Thursday, June 28, at roughly 0:00 local time (midnight). New Zealand is the first to get it, and it rolls out around the world hour by hour. We will also be releasing the 4.0 update to War of Words (the original game) a few hours prior to when the War of Words 2 rollout begins. Get ready for the ultimate battle! I’m excited to announce the next game in the War of Words series: War of Words 2! The alpha test has reached it’s conclusion, and closed beta testing begins today. War of Words 2 is coming this summer for iPhone and iPad. To sign up to be notified when War of Words 2 is released, and for a chance to win one of 10 free copies of the game, visit us at www.wordapocalypse.com. Also make sure to visit our new forums, which also just launched today! You can watch the beta test as it happens. War of Words takes second place in the Best App Ever contest! Every year, 148Apps holds the Best App Ever contest, ostensibly to focus on the best apps, not just the most popular. Today, they announced the winners for 2011. War of Words was named Second Place for Best Word Game 2011! The winners will be announced at MacWorld 2012. Thanks a bunch to the thousands of players who responded to the in-game news article and voted! War of Words 3.0 released! In addition, the tile drawing code on the server has been rewritten to correct many issues players were experiencing. Please note that in order to play on the new boards or use the Shield Tile, players must challenge an opponent who has also updated to 3.0. The War of Words v3.0 update has just entered beta testing! This update won’t ship until iOS 5 is released (probably in early October). Perhaps the most sought-after feature in this update is a brand new action tile! This is the first new action tile since the game launched earlier this year. What is this new action tile? You’ll have to wait and see! Stay tuned, and be sure to tell your friends about War of Words!